With the perfect place to stick some black paper bats, we (my sister included) started the project up and cut out over 50 bats! The tricky part was drawing a bat that looked realistic. We ended up with bats that looked fat, had no head, had legs, etc. Then my sister saved the day when she mentioned we should fold the card stock in half, draw half the bat and cut it out. Voila! You have a symmetrical bat that doesn't look half bad! Here is the exact bat I used to cut out all of its multiples. Print this guy out, cut him out, then fold in half (at the line you can see creased down his middle). Next you'll want to fold a piece of black card stock hamburger style and trace half of the bat. If you space it out well, one folded sheet of card stock will give you 3 cutout bats. And there you have it! The crease in the middle of the bat gives the off-the-wall look. We used painters tape to stick them to our stairwell. And we haven't any trouble with them stay up. Our bats are now in the entryway stairwell to our family room. They work perfectly there, leading our guests up to the main attraction! 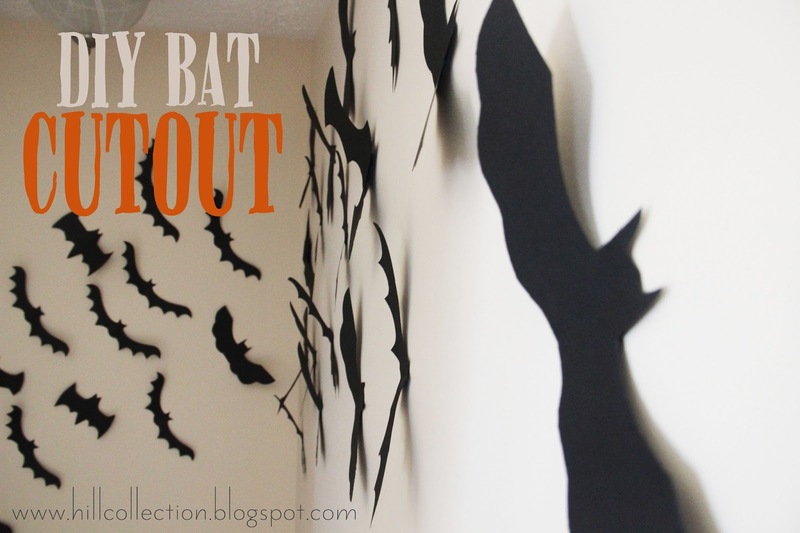 Because they look 3-D, these bats are a fun addition to any Halloween décor. Plus, they're super inexpensive to make. All you need is a little time, some black card stock, scissors, and a bit of imagination. Make sure to head HERE to download the bat! And for the DIY tutorial on making a Mason Jar Halloween Luminary, head HERE! UPDATE: See the bats making a Halloween appearance today, in October 2017!